It's Suppertime! is TV cooking, well done. 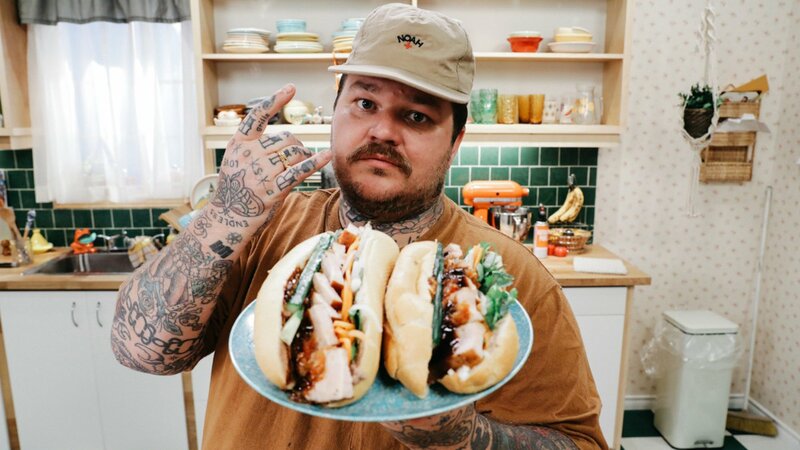 A show for culinary "Big Dogs" and "Little Dogs" alike, boisterous chef Matty Matheson gives us his "how-tos" and personal inspiration for comfort food staples to fine dining masterpieces. Spaghetti & Meatballs, Caesar salad and cheesy garlic bread coming in hot. Banh mi? No, banh you with this sandwich that's easy to make and heard to beat. A surreal Middle Eastern chicken sandwich, served on pita with scrumptious sides! Suppertime's first "Big Dog." Breathe deep, keep up and make the best pork ever! Chow down on Matty's awesome chowder to warm your cockles on a cold night. Follow Matty, and take the upscale fajita platter from the kitchen to the couch. It's a bivalve bonanza of Oysters, Clams & Mussels all in one episode. Throwing a bone to the vegheads, Matty shows us how to do eggplant parm, right. Make rich, creamy and spicy Butter Chicken fit for a Raja. 1974 called, they want you to cook Ham, Scalloped Potatoes & Ambrosia Salad. Skip the steak house on your next romantic holiday, and make surf & turf at home. Buffalo Wings, Chili Dogs, Queso - HUT! Corned beef, matzo ball soup and potato latkes! What deli dreams are made of. Things heat up with BBQ Jerk Chicken, mashed plantains and creamy coleslaw. If Adam's ribs were this good, Eve would never have stopped at just one. Eastern European pork schnitzel w/ spatzle & braised red cabbage. It's the schnit! It's no mirage. This lamb tagine has boldest, richest aromatic flavours ever. 18. Winner Winner, Chicken Dinner! Oven roasted chicken dinner with vegetables. So classic, classics call it classic. Fresh pappardelle in a beefy bolognese so good they'll call you Nonna. 20. Can You Say, Cassoulet? Duck confit, toulouse sausages, braised lamb and white beans. Mon Dieu! It's a pizza party with calamari, mozzarella sticks and kitchen sink salad. Matty takes on Japanese cuisine, cooking up a robust ramen w/chicken karaage. Shrimp Po Boy, Shrimp n Grits & Shrimp Louie, a combo that's anything but shrimpy. Meatloaf you will love so much, you'd do anything for it... yes, even "that."